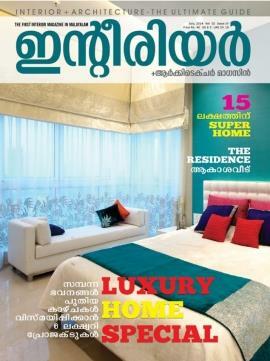 Interior+Architecture is one the most emerging architecture, interiors and design magazine in Kerala. Published in the language malayalam, 'Interior+Architecture' has rapidly grown rapidly for its innovative features and articles on inventive topics. As the mission of this media is to bring a carefully edited selection of the best architecture, design, interior projects and products from Kerala, India and around the world, it is well liked by the readers. Read more to know about Interior+Architecture. Among a handful of magazines available in the niche, Interior+Architecture has created its own space with a handsome number of readers. Launched in 2012, Interior+Architecture is one of the most emerging architecture, interiors and design magazine in Kerala. Published in the language malayalam, 'Interior+Architecture' has rapidly grown rapidly for its innovative features and articles on inventive topics. As the mission of this media is to bring a carefully edited selection of the best architecture, design, interior projects and products from Kerala, India and around the world, it is well liked by the readers. Unlike other magazines of the genre, Interior+Architecture document the interior of homes, furniture, home accessories, textiles and architecture in its highly stylized format. In its previous issues, the magazine carried features on the cutting edge designs of cafes, historic houses and eco-friendly houses. Each issue focus on a particular topic related to home design' and carries throughout stories on it. Down to earth articles will give an insight to the readers who were waiting to get knowledge about their favourite topic under discussion. Much interestingly, this publication cast as a 'how to' guide for interior decorating and styling while providing up to date design news and the latest trends in the industry. Each issue of the magazine gives prime importance to contemporary houses along with high resolution photographs. As most of the interiors are designed by interior stylists or decorators, it gives much refreshment to the readers. As the magazine gives in depth stories rather than featuring on people and focusing just on the furniture or interior, readers will get much awareness about the inventive houses introduced before them. As core team of connoisseurs who are skilled in working out interesting topics join together, each issue of Interior+Architecture magazine would deliver the best to the readers. Interior+Architecture would be the perfect choice for modern populace who wish to give a signature touch to their dream homes. This magazine also serves as a companion for the young generation. As Interior+Architecture has highly influence among all classes of people, each issue of this magazine can be treated as a collector's edition. Designed to perfection, the magazine comes with the most stylish multi colour design. Published once in a month, 'Interior+Architecture Magazine' is worth for money and can fit the bill.